It was no ordinary White House news conference. It started with a video from the 2006 Emmy Awards of President Donald Trump singing the theme song from the 1960s sitcom “Green Acres,” which showcased a wealthy New York City couple who decamp to the countryside to operate a ramshackle farm. Then Trump signed the 2018 Farm Bill. The landmark legislation, in short, removed hemp from the Controlled Substances Act. It opens the door to billions of dollars in new sales for hemp companies – think CBD-infused beverages, foods and lotions plus hemp-related goodies such as seeds and energy bars as well as clothing – and the possibility of CBD further leaping out of dispensaries and headshops and into mainstream retail outlets and consumer packaged goods. The Farm Bill means cannabis plants up to 0.3% THC are now as legal as corn or cotton, including CBD and other hemp extracts. The bill’s seismic changes include several provisions that can benefit hemp and CBD companies as well as marijuana businesses keen on launching separate hemp operations. Hemp is eligible for federally backed crop insurance, meaning farmers who grow the plant may be able to secure protection against losses from natural disasters and other woes. Banks and lenders now have Uncle Sam’s assurance that hemp is legal, no matter how it is grown or processed. Hemp businesses are not subject to the burdensome 280E tax restrictions, which wreak havoc on marijuana companies’ finances. For Joseph Hickey of Kentucky, the signing brings him full circle from the days his grandfather grew hemp in the 1940s, before the feds made it illegal in 1971. 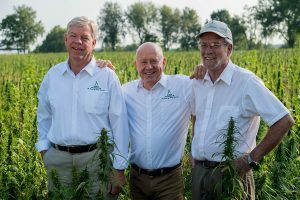 Today, Hickey leads business development for one of Kentucky’s largest hemp producers, Atalo Holdings, which grew 2,716 acres of hemp in 2018 and plans to expand to 10,000 acres this year. Though the groundbreaking law is still being parsed and questions remain about CBD’s future, here are some tips for how hemp entrepreneurs can capitalize on the Farm Bill’s passage. Many of the changes promised in the Farm Bill won’t occur overnight. Crop insurance, for example, may take a few years to materialize – but it’s not too soon to begin looking into coverage. Federally subsidized crop insurance is an unattainable cushion for marijuana producers, who have no public assistance when a crop goes moldy, is destroyed by a tornado or doesn’t produce. Agriculture and insurance experts say the tantalizing prospect of government-subsidized crop insurance for hemp could be at least three to five years away. That’s because insurers must first determine average hemp yields before being able to craft insurance policies. Tyler Mark, agricultural economist at the University of Kentucky, said not all crops are insurable and it could be years before farm insurers settle on appropriate premiums. “When it comes to hemp, insurance companies aren’t going to have any idea what an average yield should be,” Mark said. The USDA may decide that farmers who have been participating in state-level hemp pilot programs can use state harvest data to build a policy, given that the agency doesn’t yet have its own numbers. But that hasn’t been settled. “There’s a lot we don’t know yet,” Mark said. While hemp producers wait to see what crop insurance options might be available, they can still take steps to position themselves to buy crop insurance if they wish. Find an FSA office: The Farm Service Agency, the part of the USDA that oversees crop insurance is a first stop for farmers seeking crop insurance or any other government assistance. Get a farm serial number: The FSA assigns each farm a number. Many states with hemp programs already require farmers to submit the locations where they’re growing their crop, but farm ID numbers may be new to some. Take meticulous notes: The better yield data and production stats you have, the better you’ll be positioned to seek coverage. Call insurance companies anyway: Find out which companies sell insurance in your area for other crops – even if they express no interest in covering hemp. Establish a relationship with a broker who could alert you to a federal insurance change and participating insurers. Hemp farmers say they’re getting calls from questionable insurance agents offering coverage right now; don’t agree to anything before verifying the policy has USDA backing. Fortunately for hemp businesses, banking and finance changes prompted by the Farm Bill are more certain. Hemp cultivators, manufacturers and retailers can now access all the financial tools available to other small businesses – without the dreaded federal 280E tax restrictions that bar marijuana companies from taking traditional business deductions. The change was immediate for Chase Terwilliger, CEO of CBDistillery, a Denver-based manufacturer of hemp-derived CBD. Roughly 20 banks rejected Terwilliger’s company when he started it in 2016; after the Farm Bill’s signing, some of those same institutions called him back to offer accounts. And after years of fighting high-fee credit card merchant processors, who took 16% or more of every transaction, Terwilliger says he’s getting offers below 5%. The Farm Bill’s passage also is welcome news for entrepreneurs such as Jay Hartenbach, CEO of Medterra, a CBD manufacturer in Irvine, California. “I think you’re going to see a lot of banks get into this—banks that have been staying out—because of what the Farm Bill has done in terms of removing legal uncertainty,” Hartenbach said. Another immediate Farm Bill financial advantage: taxes. It’s not too soon to start claiming business deductions, said Sean Covi, a vice president at Trilogy Financial, a California-based financial services firm. R&D Tax Credit: This credit subsidizes work that seeks improved efficiencies, business performance, risk reduction or new technology. The R&D Tax Credit could apply to things your company is already doing but couldn’t deduct under 280E. Hiring a tax-reduction specialist is your best bet to finding R&D credits. Property depreciation: Businesses can accelerate depreciation on commercial assets, such as a greenhouse or manufacturing facility. Depreciation can occur even faster for a business’ personal property, such as extraction equipment within a building or even the walls and lights. “We can carve that out and it’ll depreciate over five, seven or 15 years as opposed to 39 years, which is traditional depreciation,” Covi said. Cost segregation: This is where a business conducts a study of its own assets and costs to capture other depreciable assets it might be missing. Businesses can use the cost-segregation study to force a reduction in their property taxes, because the personal business property is now depreciating faster than the real property. Work Opportunity Tax Credit: This federal tax credit incentivizes the hiring of certain employees who’ve faced obstacles landing a job, including veterans and ex-convicts. These credits start at about $900 per hire and can go up to $9,600, with an average credit of about $2,400, Covi said. The Farm Bill’s many implications will take years to play out. The biggest challenge for hemp entrepreneurs may be surviving market volatility without losing focus on the plant and bringing it to the public. “There’s this huge opportunity to jump on it now,” Medterra’s Hartenbach said. “People feel like they need to act now or never or grow their business. I wish those merchant accounts were knocking down my door for my business. Still having a hard time with that one. One major merchant provider even backed out of processing despite the passing of the bill. This article makes it sounds like everything is sunshine and rainbows now, but it’s not. The same challenges still exist.